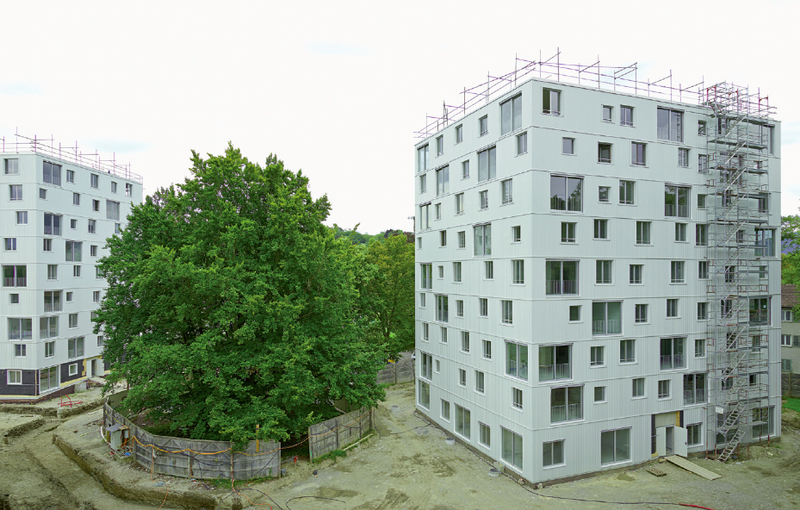 Cities Connection Project | SOCIAL HOUSING IN CAROUGE. GENEVA. La Fontenette, in Carouge, hosted since the 1950s ten buildings with 120 apartments. Despite obvious signs of decay, this complex still has interesting features, thanks to the many green areas and to the presence of beautiful trees. Having analysed the opportunity to rehabilitate the existing buildings, which proved to be inconclusive, and to respond to a shortage of low-rent housing, the owner organized an architectural competition for the construction of 335 new affordable apartments. The project reinterprets the former construction’s planning principles, which can be described as living in a park. Seven new compact buildings are freely disposed in-between the existing trees, which are preserved. They define quality outdoor spaces, providing residents great visual relationships with both buildings and landscape. The project forms a homogeneous whole. Each building acquires singularity by varying the positions and dimensions of the windows. Developed from three concentric structural rings, each floor receives different typologies of apartments, from one to five rooms. The latter are distributed by generous entrance halls characterizing the proposed typologies. On this principle, eight different floor plans are stacked and then redistributed at different levels in each building. In addition to this housing program, ground floors are dedicated to the neighbourhood, hosting extracurricular premises, two multipurpose rooms and shared laundries.